They were itchin’ on a photograph just a few years ago and now they’re itching to get their newest material out. 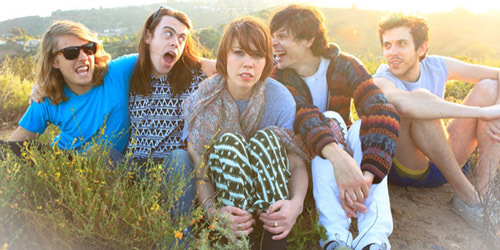 Southern California band Grouplove are entering the all-important sophomore era with the release of Spreading Rumours, their second full-length album following 2011’s Never Trust A Happy Song. It will be out digitally and physically (both on CD and vinyl) on September 17. Produced by band member Ryan Rabin, the set is a fun and playful affair in an Indian Summer setting, carrying that transition from the hot summer days of electro-pop rhythms to the cooler nights of acoustic guitar. It’s glossy, but often experimental, and gives the band room to grow into not just the rock outfit we saw on their debut album. Though sometimes peculiar, the range of styles, both musically and lyrically, are necessary to balance out this album and wrangle up all of these Rumours; now, to spill the tea on their album and some of my favorite talk-worthy tracks. Opener “I’m With You” is a sizzler with its pulsating and jungle-like drums, almost sounding like an Elastica or Garbage record out of the mid-90’s. It’s a pretty enticing way to lead you in. Lead singer Christian Zucconi sings, “What else can I do? / I’m with you / This is all I do know,” and he does know best when it comes to jamming out to the beat of this one. Following that is “Borderlines And Aliens”, which finds its strength in a bit of wordplay: note all the mentions of “black cat” in the verse followed by the “ari-ari-arigato” in the pre-chorus, arigato meaning “thanks very much” in Japanese but gato meaning cat in Spanish. At least I think it was intentional. If not, then, I’m reading too much into it as sometimes seems to be the case. It’s a decent album cut, but nothing more than that. The band is at their best when they’re bouncing around on songs like first single “Ways To Go” with its catchy beat and simplified and intriguing lyrical choices. Same goes for “Shark Attack” with its insane melting pot of genres from steel drums to a trip-hop drum shuffle, and the occasional spaced-out solo. They sing, “I met somebody in the sea of people / That’s just what I believe in.” Well, count me in too. This has future single written all over it. I also feel the same way about “Raspberry”, which, for me at least, is the “Tongue Tied” of this album – it’s familiar, it’s poppy, and you can’t get the “Raspberry, on the ferry / I was feeling kind of seasick on that boat,” line out of your head. I guess you could say that “Ways” is technically the “Tongue” of this album given its almost certain crossover potential, but sonically, “Raspberry” does it for me more. I also have to give praise to “Sit Still”, with a poppy piano and lighter instrumentation, and “Didn’t Have To Go”, showing off the vocal prowess of Hooper, from Spice Girl in the verses to saucy rocker in the chorus. While there’s plenty of good to be said about the album, there’s also some elements that are just flat-out weird. Sure, it makes them quirky, but not all of it works in their favor. “Hippy Hill” is, for a lack of a better term, different. I’m not a fan. Luckily, it doesn’t go for too long and spoil the whole thing. The following track, “What I Know”, also suffers from the same sort of problems despite a Green Day-esque guitar part that I really like. Overall, the second half of the album lacks a little bit of oomph that’s all over the first six tracks, but doesn’t completely fall off to the point that it’s unlistenable. It’s more pleasant than anything, particularly on a song like “News To Me”, which isn’t groundbreaking but I can appreciate all the work that went into it and the rest of the tracks. It’s a solid record that will ultimately keep them on the Alternative airwaves for at least one more era. After that, it’ll all depend on how the followup singles manage to place. Spreading Rumors is ultimately released on one of the more packed weeks for new releases in months, though I think it will be able to hold its own against competitors like Avicii and MGMT and debut in the top ten on the Billboard 200. I have no doubt it will be the biggest sales frame of their career; it’s just a matter of what that number is. Buyers aside, it’s the quality that counts, and Grouplove delivers. Their audience has stuck with them through “Ways To Go” and I think they’ll manage to pull in a lot of them for the album. Save the party for them; it’s only just starting to jump off. Listen to Spreading Rumours on NPR First Listen. / Pre-order Spreading Rumours on iTunes.